Arm-of-the-Sea Theater draws its name from the Hudson River Estuary, a prodigious tidal ecosystem where fresh and salt waters meet and mix. We began in 1982 on the impulse of developing an imaginative way to communicate Hudson River issues to broad public audiences. It also just so happens that one of the world’s major urban centers is at the “mouth” of this river. From the beginning our methods were pictorial—-combining sculpture and painting to create masks, puppet figures and other kinds of props, then adding movement and music to animate these visual images. Our first dramas were presented at free-to-the-public riverfront festivals, often in conjunction with the sloop Clearwater. They were large, bold and colorful; designed to hold the attention of the culturally diverse populations of the region and communicate fundamental concepts to people that perhaps were not likely to attend more formal environmental programs. The word theater comes from the Greek theatron meaning “seeing place” and theater has long been a means of looking closely at relationships. Much of Arm-of-the-Sea’s work has been to extend that “seeing” to include the air, water and soils along with the plant and animal communities that share this planet. Since our founding we have sought to give voice and representation to the non-human world and portray how the health of human communities is directly related to the health of the entire biotic community. 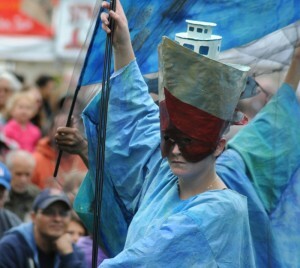 Arm-of-the-Sea’s methods are based on the symbolic and transformational qualities of visual theater. Our shows have portrayed such processes as photosynthesis, the water cycle, aquatic and terrestrial food chains, creature metamorphosis and nutrient cycles, as well as the bio-magnification of toxins, deforestation, soil erosion, loss of genetic diversity and global warming. 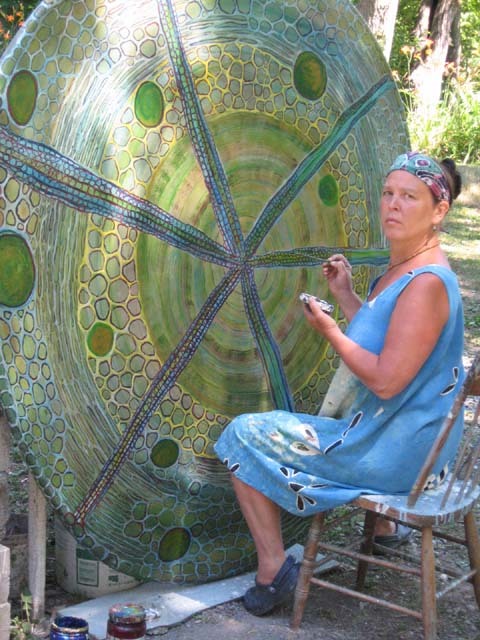 These are interwoven with scenes from everyday human affairs to create a vivid kinetic tapestry, enhancing the sense of interrelationship between humans and their environment. Theater is also uniquely suited to portraying opposing points of view. Arm-of-the-Sea shows have dramatized struggles over regional land use issues, as in the building of New York City’s massive system of water reservoirs in the Catskill Mountains (“City that Drinks the Mountain Sky”) or the long fight over dredging PCBs from hot spots in the upper Hudson River (“A Silver Swarming”, “Secret Lives of the Estuary”, “David and GE-liath”, “At the Turning of the Tide”). Other productions have explored more global issues such as the destruction of tropical rain forests (“The Water Tree”), the implications of genetic engineering (“Seed Story”), energy policy (“Pulling the Plug”, “Energy is Eternal Delight”) and human-induced climate change (“Turtle Island Medicine Show”). Young people, and urban youth in particular, immersed in a culture of materialism and evermore compelling cyber-realities, are growing up with few perceived connections to the life-support processes of the planet. From the perspective of ecological literacy, they need help seeing how their neighborhood connects to the larger biotic community. 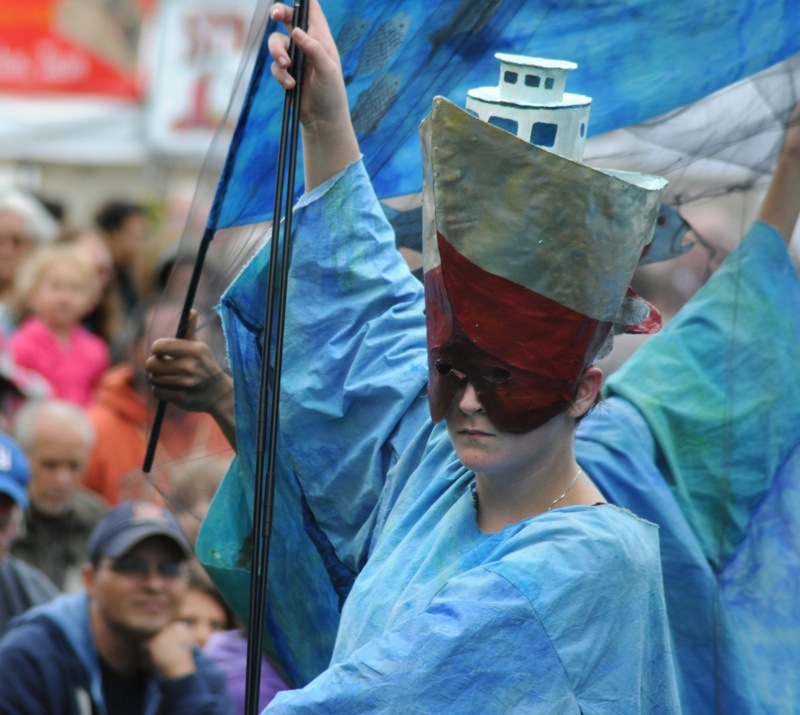 In 2004 through a grant from the US EPA, Arm-of-the-Sea developed Thinking Like a Watershed, a participatory arts and ecology workshop for urban youth. Combining basic environmental investigation with the evocative power of the arts, Arm of the Sea conducted six weeks of residency programs with inner city youth in Poughkeepsie, Newburgh & Bronx, NY. A video of the culminating performance event from the Bronx project is available upon request. Directors Marlena Marallo and Patrick Wadden along with artists Grian MacGregor, Bart Friedman and Lucinda Knaus spent the month of February, 2005 in Panama on a special performance project. Working at the Casa de Cultura in the Caribbean coastal town of Bocas del Toro, the group created two “suitcase shows” based on local themes. Then, traveling by boat, they performed these shows in Spanish in small communities on four of the islands in the Bocas archipelago. One show, “La Casa De Vida (The House of Life),” portrayed the continuous cycling of nutrients within eco-systems, concluding that: “En la Casa de Vida, no hay basura / In the House of Life there’s no such thing as waste”. The other show, “El Cayuco Rojo (The Red Dugout Canoe),” told the story of a fisherman and a leatherback sea turtle. From the Bocas region, the group traveled to Panama City to participate in a cultural festival at The Smithsonian Tropical Research Institute’s Marine Education Center at Punta Culebra. Finally, the puppeteers were invited to the old town of Portobello and presented a show on the steps of the restored Spanish Customs House. Arm-of-the-Sea is seeking other opportunities for projects abroad.